Departmental Store Escape info about the game-Games2Rule. 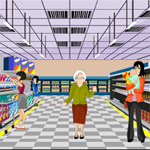 Departmental Store Escape is another new point and click room escape game from games2rule.While crossing pedestrian, a little boy was hit by a car and the car escaped from there without stopping. The little boy was bleeding his leg. A poor girl watching the accident wants to help the little boy. But the poor girl has no money, so she planned to steal some medicine in the nearest departmental store. So help the poor girl to get medicine without caught by anyone and escape from the departmental store. Good luck and have a fun!